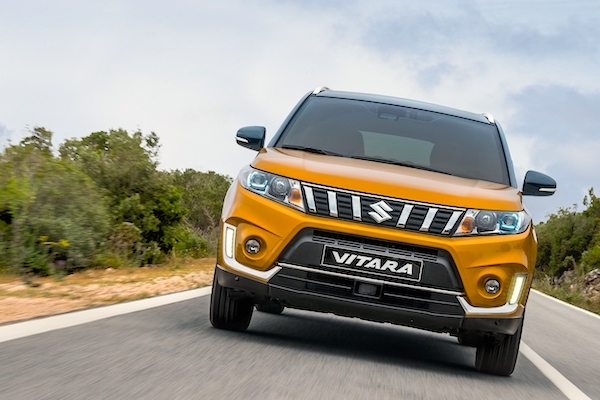 The Suzuki Vitara is up 62% to 2nd place overall in Croatia in November. According to data shared with us by our Croatian partner Promocija Plus, new car sales in the country edge up 1.5% to 3.549 registrations, meaning the year-to-date volume is now up 18.5% at 57.629 units. The -80% imploding of Ford, #1 with 17.6% share a year ago but down to #11 and 3.4% this time, is compensated by extravagant gains in the Top 8: Peugeot (+71%), Skoda (+69%), Volkswagen (+55%), Suzuki (+52%), Renault (+25%), Toyota (+17%) and Dacia (+16%) all behave splendidly, as do Jeep (+350%), Land Rover (+267%), Honda (+100%), Mitsubishi (+100%), Nissan (+40%), Seat (+34%), Smart (+25%), Mazda (+23%) and Volvo (+23%) further down the ranking. Model-wise, the VW Golf (+18%) leaps up to first place for the first time since last July, distancing the Suzuki Vitara (+62%), Skoda Octavia (+80%), Renault Clio (+100%), Hyundai Tucson (+95%+), VW Polo (+77%), Renault Captur (+184%), Peugeot 308 (+70%+) and VW Tiguan (+98%) all lodging stunning improvements. Full November 2018 Top 35 All-brands and Top 20 models below.